Welcome to the The Oaks Golf Club & Spa Internet Tee Time Reservation Service. This service allows you to book a tee time at our golf course over the Internet and get instant on-screen and email confirmation of your booking. TERMS AND CONDITIONS:These are the terms and conditions for booking tee times using ourInternet booking facility.Payment=======To book a tee time on-line you will have to enter your credit or debit card details using our secure on-line process HOWEVER WE DO NOT TAKE PAYMENT ONLINE, your card details will be held securely by us as insurance but we will NOT process the transaction until you turn up to play. When you turn up for your round of golf, you can choose to pay by cash instead of credit card. You should report to the shop before beginning your round. If the shop is closed,you should go to the bar area.Cancellation Policy===================You can cancel your booking on the web site by entering you uniqueref number.If you cancel your booking more than 1 week before your date of play,there will be no charge made to your credit/debit card.If you cancel your booking less than 1 week in advance, therewill be a charge of 50% of the green fee made to your credit/debit card.Failure To Cancel Your Booking==============================If you fail to cancel your booking, there will be a charge of 100% ofthe green fee made to your credit/debit card.Course Closed=============If you are unable to play your round of golf due to the course beingclosed (e.g. bad weather), no charge will be made to your credit/debitcard.Booking Transferable====================The Booking is completely Transferable. Therefore, should you be unableto make your tee time, you can offer the tee time to someone else suchas a family member or friend.Handicaps=========This facility is only available to golfers who have a handicap of 24 orless (men) or 30 or less (ladies). If you don't have a handicap, you must be able to play to an equivalent standard. 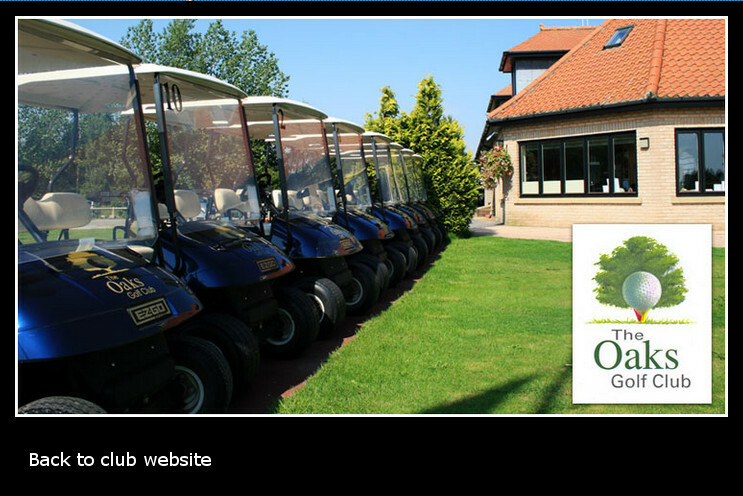 ==========May we thank you for choosing The Oaks for your golf day. To enable you to get the most enjoyment from your visit, please be aware of the following guidelines when you visit us. The dress code on the course is as follows: Only tailored shorts are allowed on the course. Sports socks only must be worn with shorts. All shirts must have a collar and be tucked in to shorts or trousers. No jeans, track suits, shell suits, cargo pants or trainers must be worn on the course. The dress code in the clubhouse is smart casual. You do not need to wear a jacket & tie, either in the bar area or in the dining room. The Elsworth Room area is a spike bar—golf shoes cannot be worn in the bar or dining area. We do appreciate that today’s pace of life means it is totally impractical to not allow mobile telephones. We do ask that they are used discreetly—(no loud tunes or anthems!!!) - both in the clubhouse and on the course. The Oaks are extremely proud of their USGA greens. Whilst we recommend, but do not insist on soft spikes being worn, we do insist that everyone carries and uses a pitch mark repairer—if you see a pitch mark on a green, even if it isn’t yours, please repair it. Gently lift the mark out and tap with your putter, do not twist your wrist, as this damages the roots of the grass. A range of pitch mark repairers can be purchased very reasonably in the golf shop before you go on the course. Please remember, slow play is the bane of everyone’s life. It is important to always keep up with the game in front. Always be aware of what is happening around you, this is particularly important at peak times. Remember, if you cannot score or get into difficulty—please pick up your ball and proceed to the next tee. The club has 10 buggies that can be booked. If you require a buggy,you should enter this in the booking form or ring the golf shop on 01757 288007. If you require to book golf clubs, trolleys, caddies, restaurant, etc you should enter these requirements in the booking form or alternatively you can contact the club directly by phone on 01757 288577.